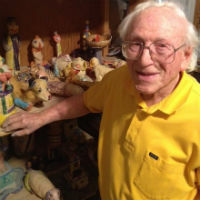 Steinberg’s solo exhibition at The Good Luck Gallery closes on April 12, and this Sunday Wery will host a special meet-the-artist event where patrons will have a chance to chat with the centenarian sculptor. Steinberg was a surgeon for most of his life and served on the battlefield during World War II. After he retired, his wife, who has been a ceramicist most of her life, convinced him to pick up clay, which manifested in a series of traditional nudes that now decorate the Steinberg’s front yard. The Good Luck Gallery’s next show features works by Jeff Cairns and Andrew Riiska. The exhibition opens on April 26. Next articleL.A. by the Slice: Why are Angelenos Ignoring the Jaywalking Laws in Downtown L.A.?